Israeli Prime Minister Benjamin Netanyahu urged all “responsible nations” to back fresh sanctions against Iran, during a visit to his British counterpart in London which was met by protests. Netanyahu met with UK Prime Minister Theresa May in Downing Street, where they discussed Iran’s recent ballistic missile test. In an unusual move, Netanyahu addressed May as the two sat before cameras and said Iran’s aggression cannot go unanswered. “We face challenges, that's very clear, from militant Islam and especially from Iran,” he said. "Iran seeks to annihilate Israel, it seeks to conquer the Middle East, it threatens Europe, it threatens the West, it threatens the world. And it offers provocation after provocation. "That's why I welcome (US) President Trump's assistance of new sanctions against Iran, I think other nations should follow suit, certainly responsible nations. Netanyanhu's visit was met with both pro-Israel and pro-Palestine demonstrations. 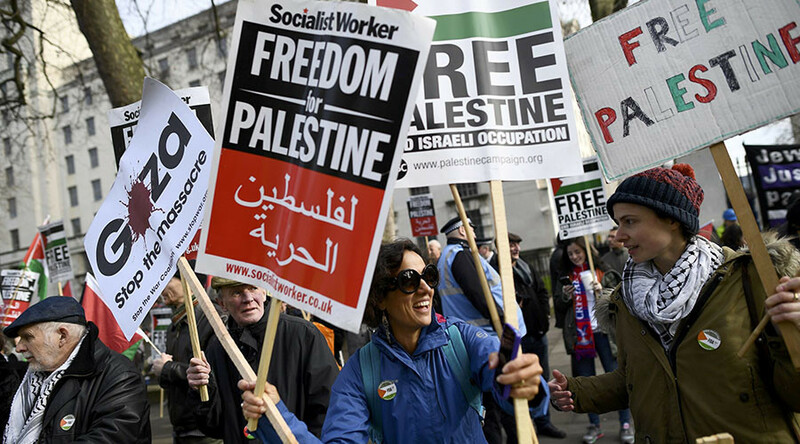 A Facebook page advertising a pro-Palestine event claimed to have support from several activist organizations, including Palestine Solidarity Campaign, Stop the War Coalition, War on Want and the Muslim Association of Britain. New admin in US, new gov in Britain, new diplomatic opportunities for Israel. I have meetings in London tomorrow & in Washington next week. Some 268 people confirmeded they will attend, according to the page. Before flying to Britain, Netanyahu said he wants to “tighten” relations with the UK in the face of the “extraordinary aggression” from Iran after the Islamic Republic tested a ballistic missile over the weekend. Tehran denies the test was in breach of the 2015 nuclear deal. “We are in a period of diplomatic opportunities and challenges. The opportunities stem from the fact that there is a new administration in Washington, and a new government in Britain,” Netanyahu said. “I intend to speak with both of them about tightening relations, between each side and Israel and trilaterally." According to the Telegraph, a Downing Street spokesman said May was expected to raise concerns about illegal settlement building, but it would only form a small part of their discussions. The resolution was able to pass because the United States made the unusual choice not to exercise its veto power. Britain played a key role in brokering the resolution, according to the Guardian, which claimed the Foreign Office did not deny it had been involved in the drafting process. Netanyahu reacted furiously to UNSC resolution 2334, reserving his strongest condemnation for outgoing US President Barack Obama. In a sign of frustration with London, Netanyahu summoned Britain’s ambassador on Christmas Day for a telling-off. Nine other ambassadors were also summoned by the Israeli PM, including the US ambassador.